Demolition begins – what of the future? A strange silence has descended on this once thriving street. Once it was busy with cars and delivery trucks as well as pedestrian traffic – neighbours walking dogs, skateboarders, children buying after school snacks, “golden girls” meeting for coffee – now there’s nobody. Even an advocate of silence, like myself, finds the silence is too loud. But this morning the stillness is broken. The crash and thump of demolition has begun. 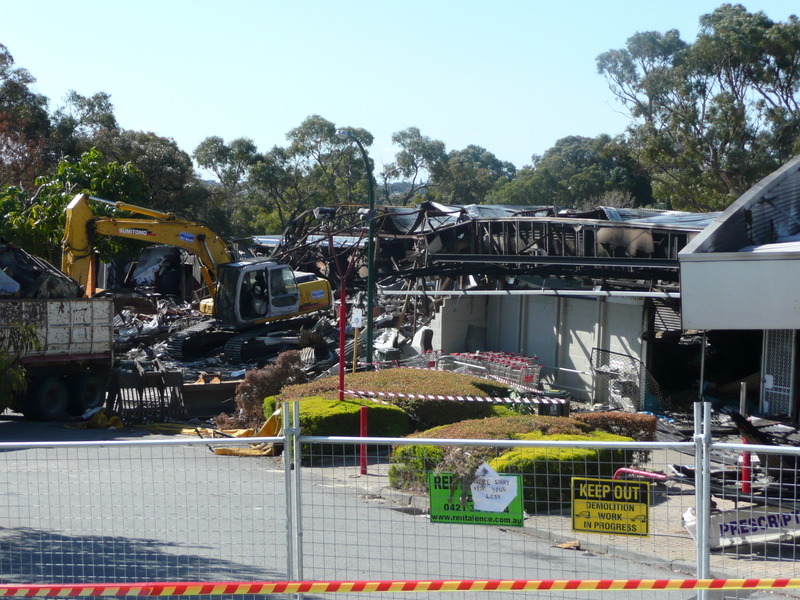 Soon the burnt out shopping precinct will be a piece of valuable vacant land. What then? How will it be redeveloped? Some fear it will be rezoned as residential. There are complications with the current commercial zoning as it is deemed that adjacent sites, some of which are public open space, should be acquired to maximise current shopping precinct needs and potential. Naturally, there is opposition to this idea. The planning and rebuilding process threatens to be a rough ride. If a good community consultation process is established, I’m sure some win-win solutions will be found.